If wading in the cool waters of a swimming pool during weekends is your idea of breaking from the monotony and humdrum of daily activities, then you are indeed a wise fitness freak, who combines leisure, hobby and exercise in an amazing way. And why not - swimming is one of the best aerobic exercises around with tremendous health benefits. However there are certain tribulations that have to be faced. Most swimming pools, especially in the third world countries use chlorine as it is the cheapest and one of the most efficient ways of disinfecting the waters. The chlorine levels in the pool waters have to be monitored constantly and regulated carefully to maintain a recommended pH level. Correct levels of chlorine in waters don’t pose much of a health hazard. But if the level becomes too high, the water can become acidic and swimming in such over-chlorinated waters can cause many problems. Our skin is very vulnerable. Water by itself can dehydrate the skin - excessive contact with water removes the thin oily film on the skin called sebum making it to lose precious moisture. And as far as soaking for long hours in hyper-chlorinated waters of a pool is concerned, the skin is subjected to the worst kind of abuse. Chlorine gets absorbed in the skin causing dryness, and even rashes, eczema and other allergies and skin diseases. If at all body lotions or ordinary sunscreens are applied to the skin prior to swimming, it can bond with these substances and cause undesirable and untoward reactions. Skin also tends to become sensitive and the possibility of getting early wrinkles, freckles, acne and other spots and blemishes cannot be ruled out. A few studies have also found that swimmers especially in indoor pools tend to have higher risk of developing asthma, as a result of high chlorine content and poor air quality around pools. Chlorine also wreaks havoc on hair. According to this source, the chemical chlorine forms a bond with the protein in your hair and causes lot of damage. The bonding of chlorine causes the protein in the hair to breakdown making it dry, coarse, brittle and unmanageable. Chlorine bonding also gives hair a harsh chemical odor. Though all types of hair are susceptible, blondes notice the effects sooner due to their generally thin hair shaft. Brunettes have built-in camouflage but the damage still occurs. However, all hues of hair lose their healthy look, color and shine. Colored and dyed hair is also ruined. Furthermore, the water in such swimming pools with excessive chlorine content can even erode tooth enamel, according to the data and studies mentioned in PubMed and some additional sources. Loss of enamel weakens teeth and makes them more sensitive to heat and cold. Symptoms of erosion include chalky or discolored teeth. In the early stages, fluoride treatments can help. In severe cases, teeth can be bonded with a chemical coating to strengthen them. In addition to the dangers of chlorinated waters on your body, if excess water gets into the ear while swimming, it remains trapped in the ear canal which causes a condition called swimmer’s ear. It’s not such a cause for concern and usually heals on its own. Only severe cases have to be referred to a doctor. But one has to avoid swimming until completely cured. Hence keep in mind the following points to minimize the health hazards while swimming and to make sure that it is friendly on your skin and hair. * Remove all make-up, body lotion, sun cream, and hair products before entering the water. *Always remember to shower before and after swimming in a pool using specially formulated shampoos used for that purpose. Hair is like a sponge absorbing water. So before you get in the pool, wet your hair with fresh water. That way, your hair won't absorb as much chlorine while you swim. All these precautions greatly help in minimizing the effects of chlorine damage on your skin and hair. You can also consider using baking soda during shampooing to remove product-build up from hair and from time to time treat your hair with this cucumber hair pack to rejuvenate it. Also remember to apply a suitable moisturizer to your skin after your swim and shower to combat dryness. * Remember to wear swim caps to cover your hair. 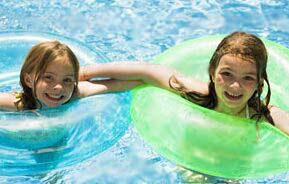 * Be cautious of a pool that has a strong chemical smell. * Swallow as little water as possible. * Be aware of any irritation to your skin or eyes. * Watch for any irritation, wheezing or any other respiratory problem that you may experience soon after swimming. Thanks for contributing this post to this week's Carnival of Family life, hosted at Health Plans Plus! As a regular participant in water aerobics, the information contained here is all valuable. I have ear infections periodically (right now, in fact), despite precautions, but never allow them to force me out of the pool. I just use earplugs. The best preventative measure is to put alcohol in the ears immediately after swimming, as it helps dry them out. Be sure to stop by the Carnival tomorrow and check out the other wonderful entries! Hi JHS, Thanks for sharing this tip about using earplugs and putting alcohol. Hi Anonymous, use earplugs while swimming, read comment #1. If you have already developed an infection visit a ENT specialist. Wow, fantastic points I will be telling this to my friends; they just can't get enough of swimming. Wet your hair before swimming in a pool. If your hair is wet before you enter a pool, it won't soak up as much chlorine. If you swim a lot and get chlorine damage, try protecting your hair before you go. Just soaking your hair in non-chlorinated water can help - if your hair is already full of water it can stop it soaking in so much chlorine - or cover it with conditioner or oil (coconut oil or olive oil). This can be a bit gross, though it does help protect your hair! Make sure you rinse out all the chlorine in the shower after. Swimming is used as a relaxation technique when combined with pleasant environment. It is believed to reduce the harmful effects of stress. Swimming is a great form of exercise as it provides a complete workout for the body, while placing less stress on joints and bones. It is an aerobic form of exercise as it requires the constant consumption of oxygen. It is used for rehabilitation after injuries or in treating those with disabilities. I used to use UltraSwim. I do think it helped. I swim five days a week. I use Suave shampoo and Quickseal conditioner. I have never, ever found a conditioner as good as Quickseal. My hair is in wonderful shape. I swim next to a swim team that practices 5 days a week. I notice that one of the ladies, before she puts on her cap, covers hair (short) hair with some sort of conditioner stuff before she gets in the water. I don't think it is Vaseline. Maybe I'll ask her what it is. That strategy might help you. It really helps if you pre-wet your hair before the pool. Get it good and wet, then blot with a towel. Then any good, thick conditioner (I prefer no -cones or protein ) slathered on your damp hair before putting it up in a swim cap. Something else that works is shea butter, or mango butter. Melt it in your hands then make sure to coat all of your hair well before putting the cap on. Don't worry, it washes right out, and will help to seal in the moisture and keep out the chlorinated water you'll be going into. I would still use the swimmer's shampoo and conditioner, because they are meant to get the chlorine out. I can vouch for the Ion brand, I've used it before, the others I can't comment on having never tried them. If you are blonde who never went swimming in chlorinated pool, I know that sometimes you can give the hair a greenish attractive. You can back hair, which is impregnated with diluted tomato juice, cover with shower cap and wait 10-15 minutes. Then rinse, shampoo, and soon ready for more fun. Can chlorine from a swimming pool water burn your skin? Clorine burns skin, eyes, and everything. It all depends on the amount of chlorine that is in the pool. Little chlorine is fine but lots hurts. Sounds like a lot. Get aloe vera and try that. Chlorine is a toxician and will do more damage than burn your skin;especially if they put alittle extra in the pool because they knew the children would be there.Then again some people just have sensitive skin when it comes to chemical. there is a swimmers shampoo that you can buy it will remove the chlorine DO NOT RE-BLEACH! Try lemon juice on your hair. Dissovle 2 asprin in a cup ru through hair in shower.Rinse youre hair with club soda. After using shampoo and conditoner use ketchup in youre hair.Whait till it wheres off. Before going for swimming dampen your hair to reduce chlorinated water absorption. Do go for a head wash to remove chlorine contents with a good shampoo. This is true. Over-chlorination may create effects on the people, most especially the ones that are swimming a lot or spends hours and hours a day under water. But there is always a solution to this. You can add up some water filters in the passage way of the water connected to the pool. professionals should know what it's called and where it is. But it should do well in minimizing the germs and the over-chlorination of the pool. Thanx a lot for sharing this valuable information to all people. People should follow this information for betterment of skin and hair.